Although dog skin diseases have numerous causes, they all have one thing in common, they make your dog miserable. If your pet displays signs of itching, inflamed skin, hair loss, crusty lesions, or unpleasant discharge, have him examined by your veterinarian immediately. Fungal infections are commonly referred to as ringworm, due to the appearance they create on the skin. Typically, the fungus causes a circular red welt that is raised along the outer edges, giving the impression of a small worm lying just beneath the surface of the skin. The ringworm fungus actually lives in soil, so pets are exposed every time they go outside; however, mainly puppies and elderly dogs contract this fungal infection because these groups have weaker immune systems than healthy adult dogs. Humans are also susceptible to this type of dog skin disease. Bacterial infections are usually secondary problems that develop once a dog has opened the surface of the skin by scratching and chewing. This gives bacteria entry into the warm, moist areas that will support its growth,resulting in increased pain and swelling in the affected area, sometimes causing a pus discharge. Puppy Pyoderma is another type of bacterial infection common to dogs. It manifests itself much like teenage acne. Pus filled bumps may appear on the head, chin, and belly areas of infected dogs. Your vet will prescribe and antibiotic for treatment. Dogs skin diseases sometimes have their origin in an allergic reaction to a substance. The reaction may be caused by a food source, an insect bite, or even an inhaled substance, such as pollen or mold. Once the allergic reaction begins, a dog will lick, bite, and scratch at the affected area, breaking the outer skin and allowing bacteria and/or fungi the chance to come in and increase the trauma to the area.Dog food allergies are on the increase, evidenced by the special canine diets sold in so many veterinary offices. While flea bites will make any dog itch, some pets are hyper-sensitive to a flea's saliva and will suffer an intense reaction to a single flea bite. 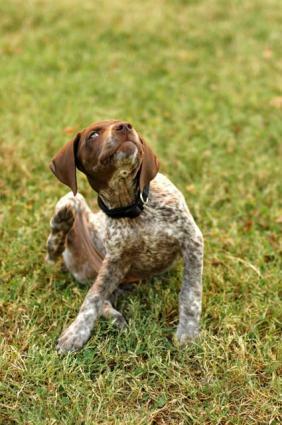 Some dogs are even allergic to grass, leading to compulsive scratching and hair loss. If you suspect your dog is showing signs of an allergic reaction, contact your vet immediately. Fleas are the number one scourge of dogs everywhere. These annoying insects are typically found in grassy or sandy areas. Although they don't live on your dog all the time, fleas will hop on whenever the opportunity for a meal appears. The flea will actually bite a dog's skin in order to drink blood, and its saliva causes much the same reaction as that of a mosquito: a raised red welt and intense itching. Once your dog has scratched enough to open the skin, further bacterial or fungal infections are possible. Demodectic mange causes hair loss, usually without severe itching, and is not transferable to humans. Sarcoptic mange causes itchy red welts on the skin and is transferable to humans. Both types of mange are diagnosed with skin scrapings, although sarcoptic mange is far more difficult to detect. Hypothyroidism, which refers to an underactive thyroid gland that does not produce enough of a hormone called thyroxine, which is needed to regulate the dog's metabolism. Hypothyroidism can lead to hair loss and dark, thick, oily looking skin. Hyperadrenocorticism, also referred to as Cushing's disease, is caused by an excessive production of cortisol, a chemical substance in the body that aids immune and inflammatory responses. Hereditary auto immune disorders cause the immune system to attack healthy tissues. Sebaceous Adenitis is one such disorder that causes the immune system to attack the sebaceous glands and eventually destroy them.